Sketching around Mahone Bay and Martin's River with pen, ink, and watercolour. Today was my last run for the year. I did a 5k form interval run around Mahone Bay. Luckily the roads are almost ice free and the wind was mild, but the -13C kept me moving for fear of turning into an ice cube. The cars gave me a wide berth, probably thinking I may be a little "touched". I started running for the first time on February 24th after reading Danny Dryer's book Chi Running which was recommended to me by James Constable. Thanks, Jamie. I cannot recommend this book highly enough. It makes sense and it has helped me to run all year injury free. I ran 5k, 10k, and Half-Marathon races this year. I wanted to run a Marathon but just did not have enough experience. My longest run was 29km. I am still slow and my best 5k is a 6:01/km pace. My goal for 2014 is to complete the Valley Harvest Marathon in Wolfville, NS on October 11, 2014. I enjoy running in winter the best and hope to be in good condition for the start of the season this coming spring. I learned the importance of hydration, nutrition, and pacing and intend to continue practicing my Chi Running forms because posture makes all the difference. It feels good to be back on the road after running very little the last three months. I would like to run 1000km next year and would have this year if I had continued my training the last three months. But I slept in and gained back some of the weight I had lost. Now it is time to hit the pavement again. So if you see me along the road, please share the road and wave, it is a great encouragement. Thank you dear friends for all your encouragement in the past and I wish you all a Happy New Year. I hadn't thought of them as Christmas Trees. I'd hate to have them know it if I was. I said, "There aren't enough to be worth while." You let me look them over." I'm going to let you have them." With a buyer's moderation, "That would do." I thought so too, but wasn't there to say so. And came down on the north. He said, "A thousand." "A thousand Christmas trees!—at what apiece?" "A thousand trees would come to thirty dollars." A thousand Christmas trees I didn't know I had! Too bad I couldn't lay one in a letter. The following is a quote from Will Buckingham, writer and philosopher, that may help us better understand the the real value of economic forecasting. Prediction, foresight, or timing are difficult, if not impossible. Their attraction is a great temptation. A better approach is to observe carefully and react quickly to the trends that naturally occur. A nice free template based on three act structure. The following is from The Organic Prepper. When you’re sick, little is more comforting than holding a steaming mug of fragrant tea in both hands, warming your face with the hot steam. Somehow, no matter how rotten you felt before, you instantly feel just a tiny bit better. Whether you are lucky enough to grow your own tea herbs, you purchase loose teas, or you use tea bags, your cabinet is not complete without the following ingredients. These teas are delicious and beneficial, with many different healing qualities. Considering that we most often turn to herbal teas for healing purposes, it’s especially important to purchase or grow organic herbs for this purpose. If your leaves are bathed in pesticide and then you add them to boiling water, instead of healing goodness, you are steeping toxins. When making tea for medicinal purposes, be sure to steep the tea in a teapot with a lid, or to cover your mug while the herbs are steeping. This helps to make a more potent brew by keeping all of the healing oils in the tea, instead of allowing them to drift into the room. Most herbs should be steeped for about 10 minutes for maximum results. There are many different herbs from around the world that have wonderful healing properties. I’ve concentrated this list on ones that can either be easily acquired and stored, or ones that can be easily grown in a backyard garden or a sunny window. Just like band-aids, antibiotic cream, or aspirin, these items are vital additions to your pantry, allowing you to dispense a hot, steaming, fragrant cup of nurturing in as little time as it takes you to boil water. Be prepared by keeping the following ingredients close at hand, and be self-sufficient by producing for yourself as many as possible (always the best way to make sure that the items were grown using safe, organic methods). Mint tea is the classic herbal tea. Mint is an ingredient in many different commercial tea blends and is much-loved for its refreshing fragrance. Mint is an herb that doesn’t just grow easily – it can quickly overtake your garden! For this reason, it is recommended to grow mint in either a container or its own bed. There are many varieties of mint and the healing properties are similar. Whether you grow peppermint or spearmint, the active component is menthol. This homely root is an ingredient in many natural cough, cold, and nausea treatments. Instead of giving your child gingerale when they are suffering from an upset stomach (and all of the HFCS and artificial flavors that come in it) brew up a nice cup of ginger tea sweetened with honey for a real dose of soothing ginger! Ginger is a tropical plant that is apparently not difficult to grow indoors. It requires excellent soil, warmth, humidity, and filtered sunlight. You can learn how to grow ginger HERE. It’s not recommended to exceed 4 grams of ginger per day – components in the herb can cause irritation of the mouth, heartburn and diarrhea if taken in excess. Click HERE to find a recipe for a delicious honey-ginger cough syrup that can also be the basis for a night-time hot toddy. Chamomile tea should be steeped a little longer than other herbal teas in order to get all of the medicinal benefits. This soothing, slightly apple-flavored tea has mild sedative properties. The petals of the tiny flowers are where the medicinal values lie. Chamomile is easy to grow from seeds. Start them in the late winter and transfer outdoors when the risk of frost has passed. Once the plants are well established, chamomile can thrive with little water during hot weather. When buying your seeds, note that German chamomile is an annual and Roman chamomile is a perennial. Chamomile tea should be avoided by people who take blood thinners. As well, those who suffer from ragweed allergies may also have an allergic reaction to chamomile, as the two plants are related. Cinnamon doesn’t just smell like a holiday in a cup, it is anti-bacterial, antiviral, and antifungal, making it an excellent all-around remedy for whatever ails you. Cinnamon is a wonderful source of immune-boosting antioxidants. Cinnamon is the fragrant bark of a tropical evergreen tree. This article from Mother Earth Living says that the trees are surprisingly easy to grow indoors in large pots. Stir cinnamon powder well into boiling water and steep for 8 minutes. Add a tea bag and steep for 2 more minutes. Stir in honey and warm milk. Lemongrass is another herb that is loaded with healing properties. The spiky, easy-to-grow plant has antibacterial, anti-inflammatory, anti-parasitic, and antifungal properties, making it helpful in treating a plethora of ailments. You can actually root the lemongrass that you buy at the grocery store to start your own patio lemongrass farm. It grows beautifully in a large pot, making it a good herb for the apartment windowsill farmer to cultivate. It can be grown year-round indoors. Check out this article for more information. This lovely flowering plant is probably the pinnacle of herbal preventatives. Echinacea is not only anti-bacterial – but it stimulates the body’s immune system to fight off bacterial and viral attacks. The medicinal properties are in the leaves and the purple flowers. Echinacea is also known as the “purple coneflower”. The plant has deep taproots and is somewhat drought resistant. It is a perennial. Sow seeds outdoors in the early spring before the last frost. These plants like full sun and they don’t like too much moisture. Rosehips make a tart, tangy pink-colored tea. They are the seed-filled pod at the base of a rose blossom, giving you a practical reason to have more rose bushes in your garden. It mixes well and enhances the flavor of any berry or fruit-flavored tea. Excess consumption of blackberry leaves (or anything containing tannins) can cause liver damage. Cloves are a wonderful addition to herbal tea just for the taste. Not only is the flavor delicious, but cloves have been used for centuries to treat a variety of ailments. The multipurpose little seed packs a mighty punch with its antiviral, antifungal, antimicrobial, antioxidant, and anti-inflammatory properties. Cloves are the dried buds of a flowering evergreen tree that is native to Indonesia, Pakistan, India, Sri Lanka, and Madagascar. They are generally imported and, unfortunately, are not easy to cultivate in other climates or greenhouse atmospheres. In high amounts cloves can cause liver damage, blood in the urine, diarrhea, nausea, and dizziness. Lemon balm is easy to grow and produces throughout the summer. The more you harvest, the more it produces. It is perennial in warmer climates. Lemon balm like rich moist soil with organic compost and partial shade in the hottest part of the day. It is another one of those herbs that can take over a garden, so plant it in a confined area. What do you keep in your herbal medicine cabinet? Why is it an important natural remedy for you? Please share in the comments section below! Ran 23.6k this morning, but planned to run 32k as the last Long Slow Distance (LSD) run before I begin a three-week taper to the October marathon in Wolfville. At 11k my back began to hurt and my cadence dropped from 90 to 85. Anita from the LIverpool Running Group diagnosed the problem for me earlier in the year, my hips were not level, and this was constricting my back. I practiced diligently the proper Chi form for weeks and my back no longer hurt. From 11k to 18k my form declined. So I tried to run/walk for a few kilometers, till at 23k I could run no more and Pamela was gracious enough to pick me up. I love running 5-13k, at those distances I seem warm up by 3k and then have a 2-10k of running in the zone. Chi running makes me feel like I do not use my legs and it feels good. At about 16k fatigue starts to break up my form and it becomes an endurance event. Since I have never run in my life and just started in March, I do not seem to have the muscle memory of others. If I run 13k I never feel tired at the end of the run. My legs feels fine. At the end of longer runs I am injury free, but sore, really sore. My feet are sensitive, my joints are stiff, and I feel a general ache all over. A coach told me recently, when I mentioned I was training for my first marathon at fifty-six after never running before, to continue, enjoy the marathon, and make it my last. I thought he was overstating the case, because of Chi Running I was not pounding the pavement as before, but something about it rang true. As my LSD runs began to extend from 20-29k, recovery time was longer after each. Two weeks ago, after running 29k, it took five days before I felt ready to run again. I have not maintained the Chi Running Forms as diligently as I did in my early training and now as the distances increase I am not able to maintain my posture. I started running in March of this year and have run eight hundred and seven kilometers to date. I have completed a 5k, 10k and Half-marathon race. I have run two additional half marathons in training and several runs of greater distance. My longest run is 29k. 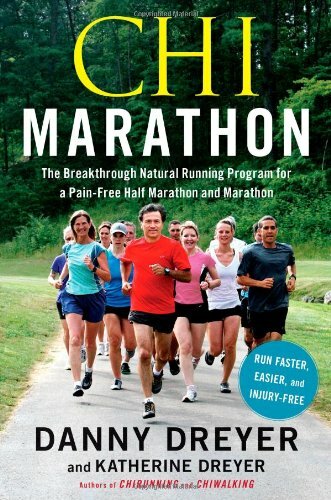 Despite the fact that Danny Dryer, the author of Chi Running and Chi Marathon recommends a new runner train a year for a half-marathon and two years for a full marathon. I tried to create a nine month training program to go from zero to marathon, and maybe if I was fitter or younger at the start I may have done better at the longer distances. I have lost 35 pounds and feel great. Most importantly I have remained injury free as Danny states in his books, Chi Running does work. Maybe I have bit off more than my body can chew in the first year. Next year I will be lighter and have longer to train. So I am going to stay with my 5-13k runs and get my weight down, then train again in the Spring next year for a marathon. Picnic and Percussion in the Park was a great success. Nineteen drummers came and played together. Kuno lead the group. We even had an audience, some even joined in drumming. We ended with a picnic. We will try to schedule another time in the coming weeks. 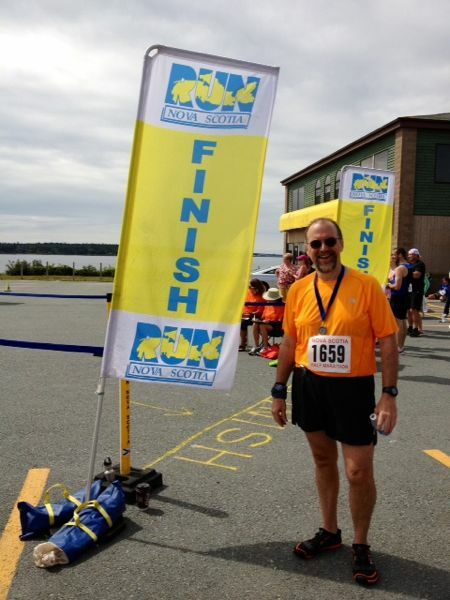 I ran my first half marathon race on Cape Sable Island in Barrington, NS on July 28th. The official time was 2:27:11 at a 6:59/km pace. I was hoping to do between 7:00-7:20 pace, so I was shocked to set a new PB as sub 7:00/km. The first 5k was cool and overcast which helped increase my pace. I am in the orange shirt in the photo above. 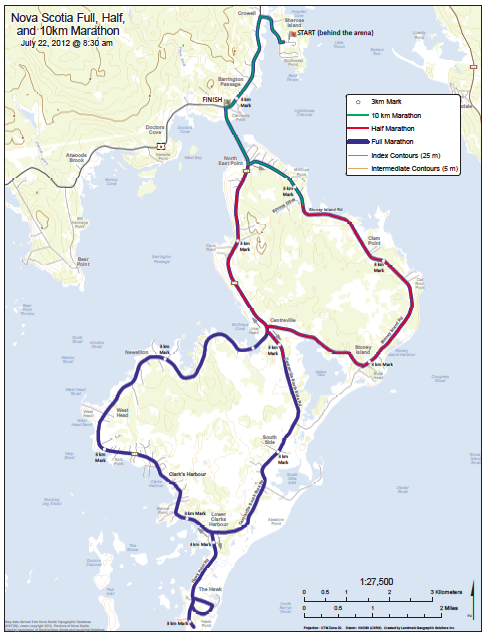 LSD (long slow distance) runs build endurance. 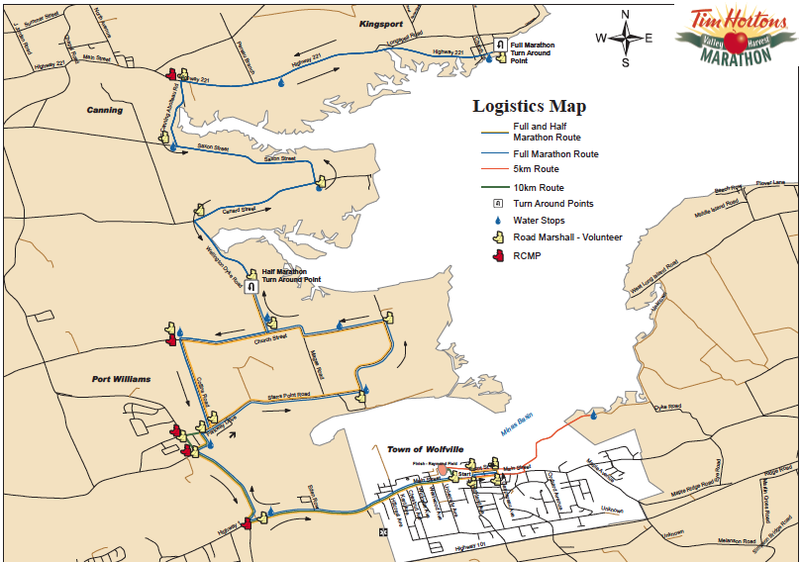 I want to participate in the Valley Harvest Marathon on October 13th in Wolfville, NS. As the race gets closer I will decide whether I can do the full marathon or just the half. But in the meantime I will train for the full marathon. Yesterday, I intended to run 12 miles at a 13:30 pace but I ran the 12 miles at a 13:03 pace and ran 10 miles the previous week at a 13:20 pace. I felt surprisingly good throughout the run. I was running mid 12s to 13 for the first nine miles and then slowed to 14-15 pace because my left adductor was tightening and It took over a mile for me to adjust my posture enough for it to relax. I ran the final mile at 12:54. Felt good. Next week it is at 13.1 mile run (half marathon distance). I must be rolling up on my toes and pushing off, because they are still sore this morning. Need to work on my mid foot strike and lifting my feet rather then pushing off with my toes. Another form focus for this week. Today is an easy run day, just to loosen up. I will let my toes rest a little more and do either an afternoon or evening run. Why did I wait so long before buying this, I will never know. In the past month we have purchased and returned two Black and Decker blenders that just stopped working. So we bought a Vitamix Total Nutrition Center (a version of the 5100) and it is wonderful. Makes the creamiest smoothies and I look forward to grinding our own whole grain flours and making soups right in the Vitamix. I love the self-cleaning aspect also. It seems expensive until you realize it replaces a blender, juicer, food processor, grinder, and you eliminate kneading and chopping from your kitchen tasks. We had it three days after we ordered and they charged no shipping and added an 8th year to the warranty. Looking forward to no mess Margaritas and Peach Ice Cream this summer. Starting February 24 I have run 5-6 days every week. The five days of February only totaled nine miles. March was eighty-seven miles. April has twenty-two miles down so far and I am up to fifty miles a week now. I am trying to maintain high volume and low intensity in my runs to burn fat and build endurance. Speed is not a concern now. I will continue to maintain a low intensity (HR zone 2) on 80% of my runs and allow speed to increase gradually over time. I have run one hundred and eighteen miles to date without injury, thanks to Chi Running and my New Balance MT-10 running shoes that feel like perfect fitting gloves on my feet. The following are my current personal records. The Gaspereau Press & Printers's latest post gives us a unique insight into the workings of a great Canadian literary press and Printer. EARTHLINGS is a powerful and informative documentary about society’s treatment of animals, narrated by Joaquin Phoenix with soundtrack by Moby. This multi-award winning film by Nation Earth is a must-see for anyone who cares about animals or wishes to make the world a better place. In an earlier post I mentioned how I read Chi Running by Danny Dreyer after Jamie Constable sent me a link through Facebook. Three weeks later I ran my first 5k here in Blue Rocks. Not fast, but it was pain free and actually felt good. 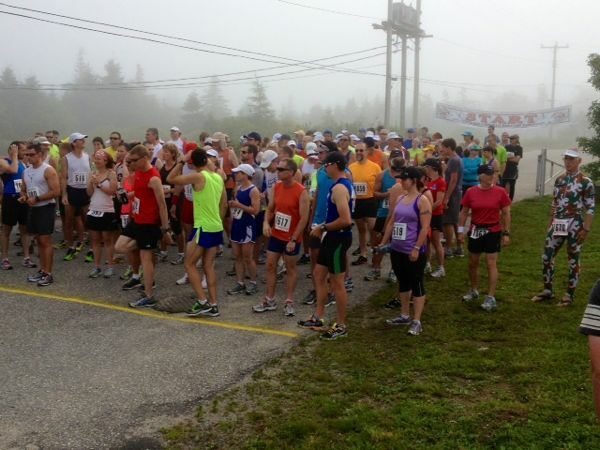 I am now planning on running the Lunenburg 5k on June 9th and the Epic Canadian 10k on June 29th. Using Danny's recommendations I created my own Training Plan below. PDF of training plan here. 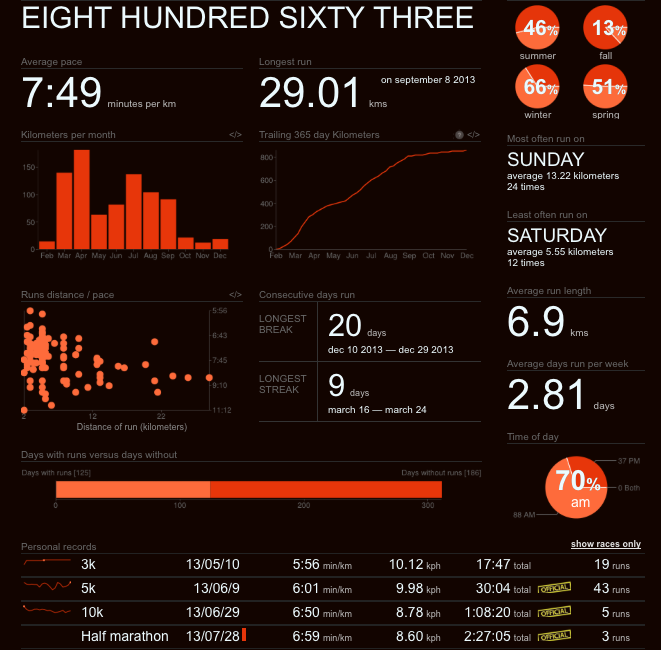 I have just completed the first week and will try to maintain the target pace for tempo and long runs. My tempo pace this week for 7:54, a minute faster than target, but my long run pace was 9:41, slower than the target, because I was trying to stay in Zone 2 (aerobic / fat burning zone) and I slowed whenever my heart rate reached 135 bpm and resumed when it dropped to 132 bpm. Today was also my first ever 10k, see below. If you would like to give running one more try, read Chi Running. The physics make sense and Danny Dreyer's clear and detailed discussion is inspiring. 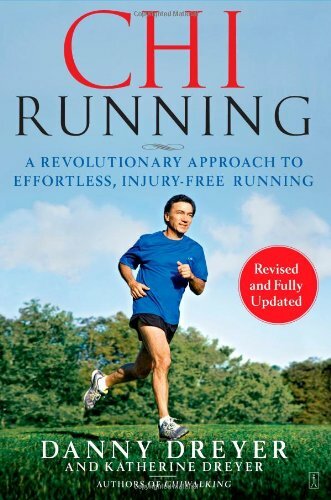 The subtitle of the book is "A Revolutionary Approach To Effortless, Injury-Free Running." It is becoming more effortless every day and feels natural. 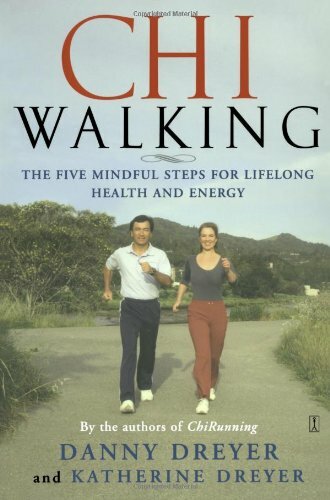 He has also written Chi Walking and Chi Marathon books. See below. See you on June 9th.